This week was my school’s winter concert. The first graders (blurry to protect them) performed a song called “The 12 Days in the Rainforest” that one of the first grade teachers wrote. It was awesome, they sang about all the animals in the rainforest. So fun, and they did a fabulous job. Our computer teacher put together a great animated presentation to go along with the song, it was wonderful. 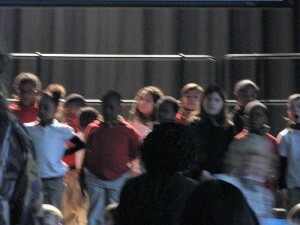 The 4th and 5th grade chorus also performed some carols and other songs to get the holiday spirit going. I love seeing students perform, it is the coolest thing. I loved being on stage as a kid, I was in every talent show, concert, and play. I also did a lot of community theater, but watching my students up there just looks so brave! I can’t believe I did all that as a kid, and it’s just so neat to see these kids get up there and sing their little hearts out. I also enjoy it because I see them in such a limited capacity that I get a real thrill out of seeing what they do when they’re not in the library or the cafeteria. Last Day of School (Before Winter Break)!